There is evidence that several intervention types, including psychotherapy, reduce repeat suicide attempts. However, these interventions are less applicable to the heterogeneous patients admitted to emergency departments (EDs). The risk of a repeat suicide attempt is especially high in the first 6 months after the initial attempt. Therefore, it is particularly important to develop effective ED interventions to prevent repeat suicide attempts during this 6-month period. We systematically reviewed randomized controlled trials of ED-initiated interventions for suicidal patients admitted to EDs using the databases MEDLINE, PsychoINFO, CINAHL, and EMBASE up to January 2015 in accordance with an a priori published protocol (PROSPERO: CRD42013005463). Interventions were categorized into four types, including active contact and follow-up interventions (intensive care plus outreach, brief interventions and contact, letter/postcard, telephone, and composite of letter/postcard and telephone), and a meta-analysis was conducted to determine pooled relative risks (RRs) and 95% confidence intervals (CIs) of a repeat suicide attempt within 6 months. Of the 28 selected trials, 14 were active contact and follow-up interventions. Two of these trials (n = 984) reported results at 6 months (pooled RR = 0.48; 95% CI: 0.31 to 0.76). There were not enough trials of other interventions to perform meta-analysis. Some trials included in the meta-analysis were judged as showing risk of bias. Active contact and follow-up interventions are recommended for suicidal patients admitted to an ED to prevent repeat suicide attempts during the highest-risk period of 6 months. PROSPERO CRD42013005463 (27 August 2013). Suicide is a critical international problem [1–3]. Prior suicide attempts and a history of self-harm behavior are the most predictive risks for death by suicide and suicide attempts [4, 5]. The risk of repeat suicide attempts is highest in the period immediately following a suicide attempt, and one in 10 patients repeat within 5 days (median first repetition: 83·5 days; interquartile range: 20 to 187 days) . Therefore, it is important to develop effective interventions to prevent repeat suicide attempts during the highest-risk period of 6 months. In England, 220,000 patients per year are admitted to the hospital for self-harm behaviors . In the United States, 538,000 patients per year are admitted to the emergency departments (EDs) for attempted suicide and self-injury . Therefore, ED is the one of the best settings in which effective interventions for such patients could be developed [9, 10]. There have been previous systematic reviews and meta-analyses of interventions for repeat suicide attempts, although these have not focused solely on ED settings. 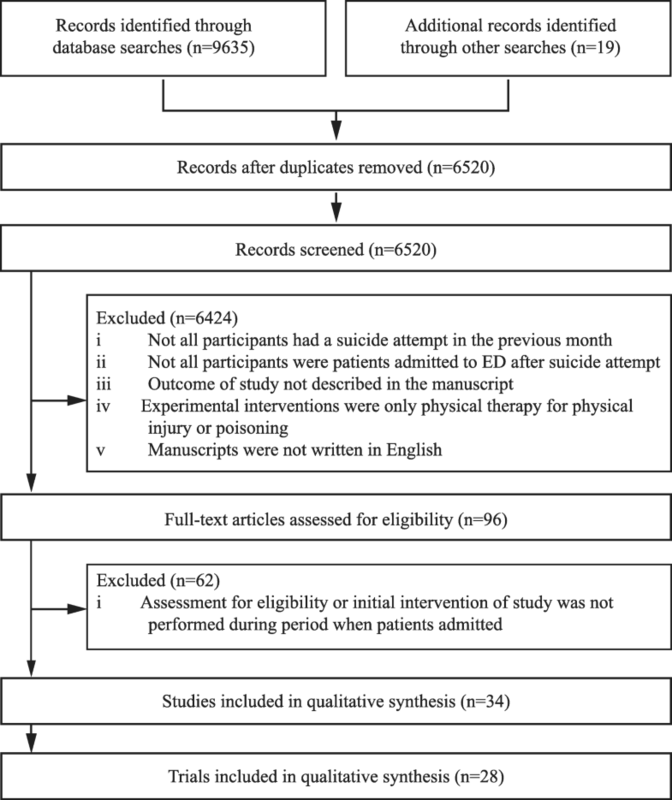 One previous systematic review showed that cognitive–behavioral therapy- based interventions for patients with a history of suicidal behaviors reduced repeated suicidal behaviors within 12 months . Another systematic review of brief contact interventions (telephone, letter, or postcard) showed a reduction in the rate of repeated suicidal behaviors in 12 months . One meta-analysis showed that psychosocial and behavioral interventions that directly address suicidal thoughts and behavior are effective post-treatment (mean duration: 11·3 months), whereas treatments that indirectly address these components are only effective long-term . However, these studies did not report the results at 6 months and therefore have limited application to ED settings, although the risk of repeat suicide attempts is highest in the period immediately following a suicide attempt . We previously performed a systematic review and meta-analysis of trials assessing the effects on repeated suicidal behavior of ED-initiated interventions for suicidal patients admitted to EDs . In the previous review study , we categorized interventions by type. The categorization was carried out by the research team, which comprised psychiatrists and psychologists who had experience of working in suicide prevention at EDs. Intensive care plus outreach, brief intervention and contact, letter/postcard, telephone, and composite of letter/postcard and telephone were categorized as active contact and follow-up interventions. The active contact and follow-up interventions were developed empirically and were applicable to ED settings. The previous meta-analysis showed that, in nine trials, the interventions significantly reduced the risk of a repeat suicide attempt within 12 months . Other types of intervention, including psychotherapy, had no significant effects on risk reduction . However, the data did not indicate which interventions were effective in ED settings during the highest-risk period of 6 months, although research indicates that the risk of repeat suicide attempts is highest in the period immediately following a suicide attempt . Since our previous systematic review and meta-analysis, the results of several trials evaluating the effect of interventions at 6 months have been published. Therefore, this study examines the effect of ED-initiated active contact and follow-up interventions on the risk of a repeat suicide attempt within 6 months in patients admitted to an ED for suicidal injury. We also examine the effect at 12 months as a secondary outcome. We conducted our systematic review and meta-analysis in accordance with the method used in our previous study  and an a priori published protocol (http://www.crd.york.ac.uk/PROSPERO/display_record.asp?ID=CRD42013005463), and have reported the results according to the PRISMA criteria for systematic reviews and meta-analyses . Therefore, we briefly describe the method as follows. We conducted a search of the databases MEDLINE (from 1949), PsychINFO (from 1887), CINAHL (from 1981), and EMBASE (from 1974) from their inception to January 2015. Search terms were (suicide* OR self-harm* OR self harm* OR self-poison* OR overdose* OR self-injur*) AND (randomize* OR randomis*). We also examined the reference lists of identified studies for further references. We did not distinguish between suicide attempts and deliberate self-harm or self-injury in accordance with a previous report  and our previous study . Inclusion criteria were as follows: all participants had attempted suicidal behavior within 1 month and had been admitted to an ED for their suicidal behavior, assessment for eligibility for initial interventions in the trial was performed while the patients were in the ED or a subsequent ward, and the effect of the intervention was examined using a randomized controlled trial and was described in the manuscript. We determined the first two criteria in accordance with our previous systematic review and meta-analysis  to ensure that trial participants had been admitted to EDs and that interventions had been initiated during the ED admission. We focused on trials that included patients who had experienced serious injury as a result of their suicide behavior and who required ED admission, as such patients are likely to be at higher risk of repeat suicide . It is probable that this criterion largely excluded patients displaying milder self-harm behaviors and included patients displaying severer suicidal behaviors with serious suicide intent . The exclusion criteria were as follows: experimental interventions comprising only physical therapy for physical injury or poisoning, manuscripts not written in English, and studies in which the main outcome was a subgroup analysis of the trial. Summary tables were created by extracting data on type of intervention, number of participants, inclusion and exclusion criteria, adherence of participants to interventions, proportion of participants followed up for outcomes, and effects of the interventions on repeat suicidal behaviors and death by suicide. We extracted and summarized data on the psychological measures used as outcomes. In accordance with our previous study , we classified the selected trials into four groups (active contact and follow-up interventions and the subtypes [e.g., intensive follow-up, outreach, case management, telephone call, and letter/post card interventions], psychotherapy [e.g., problem-solving approach, psychodynamic interpersonal therapy, cognitive/behavioral/cognitive–behavioral therapy], pharmacotherapy, and miscellaneous). The categories were determined by the researchers of the previous study, who were psychiatrists and psychologists with experience of working in suicide prevention at EDs. We assessed the risk of bias according to the Cochrane Handbook for Systematic Reviews of Interventions (Version 5.1.0) . We performed a meta-analysis to examine the effect of each type of intervention on a repeat suicide attempt during the 6 months. As a secondary analysis, we also performed a meta-analysis of the effect at 12 months to incorporate data that had been published since our previous meta-analysis . We systematically reviewed all types of psychometric measure used in the selected trials. However, we could not analyze data from psychometric measures (such as measures of depression, hopelessness, and suicidal ideation) as outcomes. The reviewed trials used different kinds of psychometrics at the various measurement points. In addition, some trials used ad hoc questions that had not been validated. 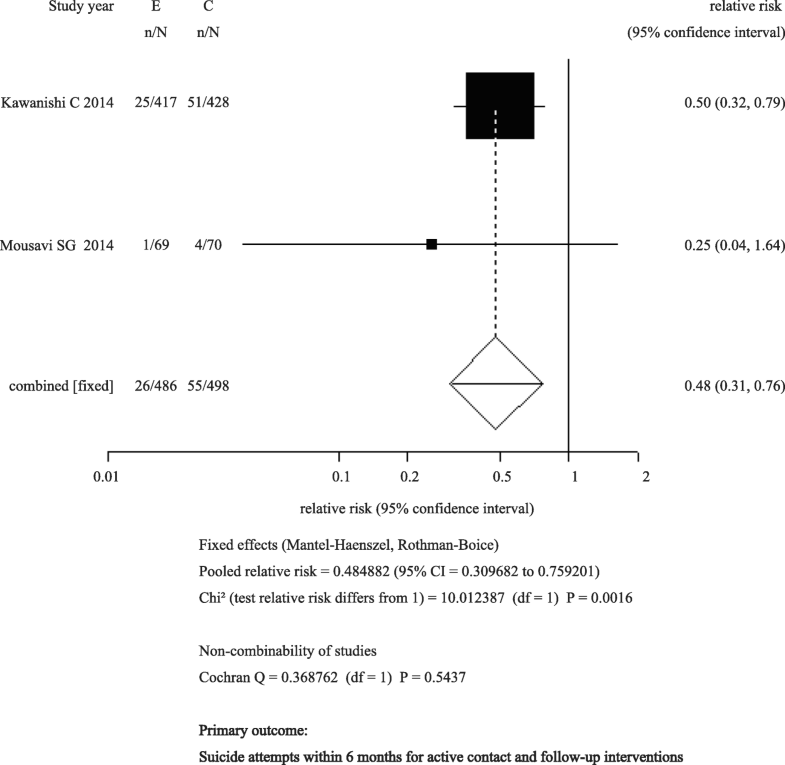 The meta-analysis was performed using similar method to that in our previous meta-analysis  to determine pooled relative risks (RRs) and their 95% confidence intervals (CIs). A fixed-effects model using the Mantel–Haenszel method or a random-effects model using the DerSimonian–Laird method  was used. From 9654 records identified through database searches and other searches, 6520 articles were retrieved after duplicates were removed. Of the 6520 articles, we included 28 trials that reported results in 34 publications [21–54] of any interventions initiated at an ED for admitted suicidal patients (Additional file 1: Table S1: List of selected trials and publications, Additional file 2: References in the additional files, and Fig. 1). We classified the 28 trials (Additional file 1: Table S1) into four categories by intervention type: active contact and follow-up interventions (Table 1) (18 publications from 14 trials) [21, 24, 25, 27–30, 33, 37–41, 44, 45, 50–52], psychotherapy (12 publications from 10 trials) [22, 26, 32, 34–36, 42, 43, 46–48, 54], pharmacotherapy (1 publication from 1 trial) , and miscellaneous interventions (3 publications from 3 trials) [31, 49, 53]. Fourteen trials in 18 publications were active contact and follow-up interventions (Table 1). Ten trials were in the psychotherapy group, one in the pharmacotherapy group, and three in the miscellaneous group. We have listed the publications on psychotherapy, pharmacotherapy, and miscellaneous interventions and described the contents of the interventions in each trial in Additional file 3: Table S2. We have summarized the results (e.g., number of patients making suicide re-attempts, suicidal deaths, and any-cause deaths) of each publication in Additional file 4: Table S3. The characteristics of the included studies are shown in Additional file 5: Table S4: Subjects, Additional file 6: Table S5: Adherence to intervention and follow-up rate, and Additional file 7: Table S6: Measures of suicidal behaviors. The number of trial participants varied from 18  to 2300 [37, 38]. The psychotherapy group contained a relatively small number of participants (from 18  to 400 ) compared with the active contact and follow-up group (from 66  to 2300 [37, 38]). As shown in Additional file 6: Table S5, intervention adherence and follow-up rate were not high, suggesting possible bias in the trials. The results of the psychometric measurements and other outcome measures used in the selected trials are shown in Additional file 8: Table S7a–7 h and Additional file 9: Table S8, respectively. A considerable variety of psychometric measures were used, including ad hoc questions. Not all psychometric measures had been validated or had associated reliability data. Trials measured not only suicidal ideation but also hopelessness, sense of belonging, depression, anxiety, general mental health, alcohol-related problems, quality of life, global functioning, problem solving, and other factors. Among the psychometric measures, the Beck Hopelessness Scale (BHS), the Scale for Suicide Ideation (SSI), and the Beck Depression Inventory (BDI) were validated, and the data were used to predict suicidal behavior and/or suicidal ideation (Additional file 8: Table S7). The BHS was used in seven trials (reported in eight publications), the SSI was used in seven trials (eight publications), and the BDI was used in five trials (six publications), making these the main psychometric measures used in the included trials. Additional file 10: Table S9 shows the results of the risk of bias assessment. Many trials showed a high risk of bias, and most trials did not include information about blinding of participants and personnel. We extracted the intervention results for selected trials by suicide behavior (repeat suicide attempt, and suicidal death) and any cause of death. Active contact and follow-up intervention results are shown in Table 2, and results for other types of intervention are shown in Additional file 4: Table S3. We performed a meta-analysis of the effect of the active contact and follow-up interventions on repeat suicide attempts at 6 months as a primary meta-analysis and at 12 months as a secondary meta-analysis. 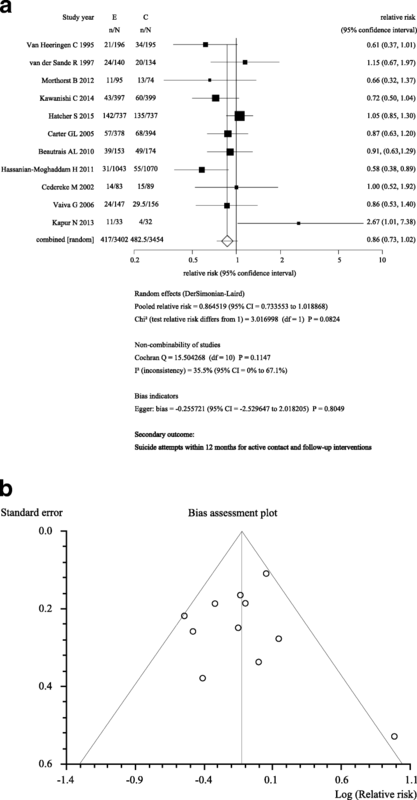 The results of the primary meta-analysis examining the effects at 6 months are shown in Fig. 2. As the results of the systematic review, this meta-analysis included two trials [41, 45] (n = 984). There was a statistically significant effect of the intervention on prevention of a repeat suicide attempt (RR: 0.48; 95% CI: 0.31–0.76). The results suggest that active contact and follow-up interventions reduce the risk of a repeat suicide attempt within 6 months in patients admitted to an ED with suicidal injury. The meta-analysis included trials by Kawanishi et al. and Mousavi et al. . The intervention in the trial by Kawanishi et al. was called ACTION-J. It comprised assertive case management (based on psychiatric diagnoses, social risks, and patient needs) that included periodic contact with participants during their ED stay and after discharge, encouragement of participants to adhere to psychiatric treatment, coordination of appointments with psychiatrists and primary care physicians, referrals to social services and private support organizations, coordination of the use of these resources to accommodate the individual needs of patients, and provision of psychoeducational content and information about social resources . The intervention in the trial by Mousavi et al. constituted seven follow-up telephone contacts after discharge in the second and fourth weeks, and in the second, third, fourth, fifth, and sixth months, by a final-year psychiatric resident . None of the nine selected trials of psychotherapy interventions examined the effect on a repeat suicide attempt at 6 months. There was only one trial of a pharmacotherapy intervention, which did not report the effects on a repeat suicide attempt at 6 months. As our secondary meta-analysis in addition to the primary meta-analysis of the effect at 6 months, we also examined the effect of active contact and follow-up interventions at 12 months to incorporate data that had been published since our previous meta-analysis . Figure 3a and b shows the results of the meta-analysis of 11 trials (n = 6859) for a repeat suicide attempt within 12 months. Two new trials [39, 41] were added to our previous meta-analysis . The risk of a repeat suicide attempt was reduced, but this was not statistically significant (RR: 0.86; 95% CI: 0.73–1.02). Among the trials included in the meta-analysis, the study by Hatcher et al. used the Zelen design. Although 737 patients were randomly allocated to the intervention group, only 327 participants consented to receive the intervention. Of the remaining 737 patients randomly allocated to the treatment as usual group, only 357 consented to receive treatment-as-usual and to be followed up. The intent-to-treat (ITT) analysis included those patients who did not consent to receive the interventions (n = 410 in the intervention group and n = 380 in the treatment-as-usual group). This may have diluted the effect of the interventions. To avoid this problem, we performed a post hoc meta-analysis excluding the Hatcher et al. trial and found a significant reduction in the risk of a repeat suicide attempt at 12 months (RR: 0.82; 95% CI: 0.69–0.98). Hatcher et al. also performed per-protocol-based (PPB) analysis using a different analysis set comprising participants who consented to receive the intervention (n = 327) and treatment as usual (n = 357). Another study by Morhorst et al. reported results from two types of outcome measure: medical records and patient self-reports. We suspected that a meta-analysis using combinations of the two analysis sets from the Hatcher et al. trial and the two different outcomes from the Morhorst et al. trial  would show different results. The meta-analysis results for the four patterns [2 (ITT and PPB) by 2 (medical records and self-reports)] are shown in Additional file 11: Table S10: Four patterns of suicide attempts within 12 months in the active contact and follow-up group. There have been no newly published trials of psychotherapy or pharmacotherapy interventions for suicide attempts within 6 months and 12 months since our previous meta-analysis . The present study focused on the prevention of repeat suicide attempts during the highest-risk period after a suicide attempt (within 6 months). Our meta-analysis showed that active contact and follow-up interventions were effective in preventing a repeat suicide attempt within 6 months in patients admitted to EDs for suicidal injury. The selected trials used ED-initiated interventions. Thus, compared with findings from interventions developed for other settings, the present findings are more applicable to high-risk patients admitted to EDs for suicidal behavior. Previous meta-analyses of cognitive–behavioral therapy-based interventions  and brief contact interventions  are not specific to patients admitted to EDs. Active contact and follow-up interventions may reduce the risk of a repeat suicide attempt within 12 months. In the present meta-analysis, two trials (publications No. 5 by Kawanishi et al. and No. 6 by Hatcher et al. in Additional file 1: Table S1) [39, 41] were added to nine trials included in our previous meta-analysis . One of the trials by Hatcher et al. used the Zelen design. Of the 737 patients randomly allocated to the intervention group, more than half (410 patients: 56%) did not consent to receive the intervention. This may have diluted the effect analyzed in the present meta-analysis. The post hoc meta-analysis excluding this report showed a significant reduction of the risk at 12 months. The present findings demonstrated that active contact and follow-up type interventions were effective in reducing the risk of a repeat suicide attempt within 6 months. Active contact and follow-up interventions could reinforce connectedness among patients and care providers. However, the precise mechanisms by which the interventions reduce repeat suicide attempts are unclear, and further research is needed. As previously proposed , it is very important to provide care to adolescents and young adults who self-harm and are admitted to EDs. Fifty-eight percent of participants in the Mousavi et al. trial (included in the present meta-analysis of suicide attempts within 6 months) were aged between 15 and 25 years. However, the Kawanishi et al. trial excluded patients younger than 20 years. Therefore, the present findings regarding the effect of active contact and follow-up interventions may not be generalizable to a young population. The present findings are not conclusive regarding the effect at 6 months of ED-initiated psychotherapy interventions to reduce the risk of a repeat suicide attempt among patients admitted to an ED for suicidal injury. There were too few trials of psychotherapy interventions to perform a meta-analysis of the effect on a repeat suicide attempt at 6 months. More trials with large samples measuring the effect of interventions on suicide attempts are needed. Some of the selected trials did not report figures for suicide attempts (Table 2). The number of suicide attempts was small, even in trials reporting the outcome. Most of the selected trials used various psychometric measures (Additional file 8: Table S7). The BHS, SSI, and BDI were the most frequently used measures, and have been previously validated and shown to predict suicide behavior. The use of such validated and standardized psychometric measures as a core outcome set is recommended and could facilitate future meta-analysis of the effect of interventions. This study has several limitations. First, some of the interventions included may have beneficial effects on other psychological symptoms, and not all interventions reduced repeat suicide attempts. Second, although the trials included in the meta-analysis used control groups receiving treatment as usual, these treatments probably differed across studies. Third, for convenience, we categorized interventions into an active contact and follow-up group; however, the interventions within this group may have been different. Finally, some trials included in the meta-analysis were judged as showing risk of bias (Additional file 10: Table S9). In summary, the meta-analysis results indicate that active contact and follow-up interventions reduce the risk of a repeat suicide attempt within 6 months in patients admitted to an ED with suicidal injury. We recommend that this type of intervention be implemented to reduce patients’ suicide attempts. The findings may have implications for future clinical policy-making on the prevention of repeat suicidal behavior. This type of intervention could be adopted throughout EDs to reduce the risk of repeat suicide attempts. We especially thank Ms. Mayumi Matsutani, Ms. Hitomi Muramatsu, and Ms. Shoko Yoshimoto for their research assistance. We thank Diane Williams, PhD, from Edanz Group (https://www.edanzediting.com/) for editing a draft of this manuscript. This study was supported by the Research and Development Grants for Comprehensive Research for Persons with Disabilities from the Japan Agency for Medical Research and Development (AMED). The funding source had no involvement in any aspects of study design; in the collection, analysis, and interpretation of data; in the writing of the report; or in the decision to submit the article for publication. MI had full access to all study data and takes responsibility for the integrity of the data and the accuracy of data analysis. MI drafted the manuscript and provided administrative, technical, and material support. All authors contributed to the study concept and design. MY obtained funding. All authors contributed to the extraction and acquisition of data. NY and YK conducted the statistical analysis. All authors interpreted the data. MY supervised the study. All authors critically revised the manuscript or contributed important intellectual content. All authors read and approved the final manuscript. MI has received lecture fees from Pfizer Japan Inc.; Mochida Pharmaceutical Co., Ltd.; Shionogi & Co., Ltd.; Sumitomo Dainippon Pharma Co., Ltd.; Daiichi Sankyo Co., Ltd.; Meiji Seika Pharma Co., Ltd.; and Takeda Pharmaceutical Co., Ltd. outside the submitted work. He has received royalties from Nippon Hyoron Sha Co., Ltd.; Nanzando Co., Ltd.; Seiwa Shoten Co., Ltd.; Igaku-shoin Ltd.; and Technomics, Inc. outside the submitted work. He has received grant or research support from the Japanese Ministry of Health, Labour and Welfare and the Japanese Ministry of Education, Science, and Technology. Dr. Inagaki’s institution has received grant or research support from Eisai Co., Ltd.; Mochida Pharmaceutical Co., Ltd.; Astellas Pharma Inc.; Otsuka Pharmaceutical Co., Ltd.; GlaxoSmithKline K. K.; Shionogi & Co.; Sumitomo Dainippon Pharma Co., Ltd.; Jansen Pharmaceutical K. K.; Pfizer Japan Inc.; MSD K. K.; Yoshitomiyakuhin Corporation; Daiichi Sankyo Co., Ltd.; Meiji Seika Pharma Co., Ltd.; Tsumura & Co.; AbbVie; Ono Pharmaceutical Co., Ltd.; and Eli Lilly Japan K. K. YK has received royalties from Seiwa Shoten Co., Ltd. outside the submitted work. He has received grants from Seseragi-Foundation and an Intramural Research Grant for Neurological and Psychiatric Disorders of National Center of Neurology and Psychiatry outside the submitted work. MY has received grant or research support from received grants from the Japan Agency for Medical Research and Development during the study; grants from the Ministry of Health, Labour and Welfare, Japan; grants from the Ministry of Education, Culture, Sports, Science and Technology, Japan; grants from The Japan Science and Technology Agency; grants from the National Center of Neurology and Psychiatry; personal fees from Meiji Seika Pharma Co., Ltd.; personal fees from MSD K.K. ; personal fees from Asahi Kasei Pharma Corporation; personal fees from Seishin Shobo; personal fees from Seiwa Shoten Co., Ltd.; personal fees from Igaku-shoin Ltd.; personal fees from Chogai Igakusha; and personal fees from Sentan Igakusha. All other authors declare that they have no competing interests. World Health Organization. Health statistics and information system, Disease burden and mortality estimates. https://www.who.int/healthinfo/global_burden_disease/estimates/en/index1.html. Accessed 12 Jan 2019. World Health Organization. Preventing suicide—a global imperative. http://apps.who.int/iris/bitstream/10665/131056/1/9789241564779_eng.pdf?ua=1. Accessed 21 Apr 2016. Cochrane Collaborative. Cochrane handbook for systematic reviews of interventions, Version 5.1.0 [Updated March 2011]. http://handbook.cochrane.org/. Accessed 12 July 2013.